Bearish trend dominated the Pakistan Stock Exchange on Monday, as the benchmark KSE-100 index dropped by more than 1050 points to reach 42,153.38 points. The first day of the week saw investors inclined towards the selling trend. The investors showed a tendency towards the selling side as the stock market opened to political uncertainty on Monday. The constant decrease in foreign exchange reserves and current account deficit, which has reached one billion dollars, made investors cautious. 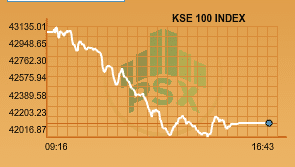 At close, the benchmark KSE 100-share Index recorded a loss of 925 points or 2.15% at 42153.38. 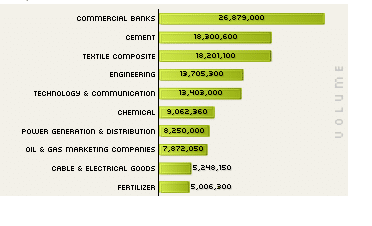 The cement sector made a huge impact on the market making it red whereas the Oil sector was the only positive sector. The KSE-100 index shed a further 5% or 2210 points in the outgoing week to close at 2017 to date low of 43078 points. From its peak level seen on May 2017, index is down 19% as political and economic concerns weigh on investors sentiments. Trading volumes went down to 153 million shares compared with Friday’s tally of 188 million. The value of shares traded during the day was Rs7.80 billion. At the end of the day shares of 364 companies were traded. At the end of the day, 44 stocks closed higher, 310 declined while 10 remained unchanged. Azgard Nine was the volume leader with 15.12 million shares, losing Rs 0.22 to close at Rs16.04. It was followed by Bank of Punjab with 11.4 million shares, losing Rs 0.50 to close at Rs 9.73 and TRG Pakistan with 8.75 million shares, losing Rs2.14 to close at Rs40.77 and K-Electric Ltd with 6.81 million shares losing 0.30 close at 6.27. Whereas, Abbot Laboratories announced their result with 38% growth in Profits QoQ with Rs 9.94 earning per share for the quarter ended and Packages with slight increase in profits with 8 % growth in sales. Mutual funds were the major sellers during the last week with the net selling of US $23.6 million whereas banks bought US $9.4 million. Foreigners were the net sellers of US $2.0 million during the whole week against selling of US $ 31.2 million during last week. World stocks struggled at a 5-1/2-week low on Monday, though metals dazzled with zinc at its highest in a decade, copper hitting a nearly three-year high and iron ore’s gains in the last two sessions stretching to 5 percent.